They were in church today and seemed per­fectly happy. Eric told me that their res­cue took place in a thun­der­storm, so every­one was wet! It has rained for over 31 hours now, only stop­ping for 15 minute inter­vals every now and then. The Mon­tepuez River which crosses the road to the 3 Mango Tree churches in the Mavala area, was 300 meters out of its banks. The water is 4 feet OVER THE TOP of the bridge. Pas­tor Alberto had to turn back this morn­ing, as he was sup­posed to preach in the Mpaca church today. Our prayer is that these heavy rains will not dam­age the corn and bean crops, as the men and women who grow the food that ben­e­fits our orphans live in this area. These people’s lives depend on their crops. Not only to sell to meet their needs, but to EAT, as there is no agency in our area who gives food to those who’s crops fail for what­ever reason. IN THE NAME OF JESUS, we com­mand the rains to fall in mod­er­a­tion and not drown the crops! Let the SUNSHINE bless the earth and the SON of GOD SHINE and bless those crops! Your prayers needed urgently to help us find them. Eric noti­fied me this morn­ing that a man claim­ing to be the father of Momadi (age 4) and Denise (age 7) came to their fos­ter home (Atija’s house) late yes­ter­day and took the boys. These boys were signed over by their older sis­ter 4 months ago as wards of Social Ser­vices and placed in our care, when their 19 year old sis­ter aban­doned them. Their uncle and this sis­ter told us the parent’s of these 2 boys are dead. So we are con­cerned about “human traf­fick­ing” being behind this as no one had ever seen this man. We do have a lead as to what vil­lage they were taken too, but it con­tains a pop­u­la­tion of 5,000 peo­ple and NO ONE knows this man’s name. So it will take HOLY SPIRIT POWER to lead them to find these boys. Your prayers are appre­ci­ated and we will keep you informed as news is received. THANK YOU for help­ing us call in the heav­enly help needed to res­cue these 2 young boys. I’m in Louisiana for pre­sen­ta­tions in 2 churches in 2 dif­fer­ent cities from today till next Thurs­day. I appre­ci­ate and say THANKS to all of you who are pray­ing for me dur­ing this tour. It is going well and God is mov­ing to make sure that our kids have the food and care they need this year. While Bush Bunny Brenda is trav­el­ing in the USA she wants to share the lat­est news from Balama, as Linda Stan­ley writes. Linda is our favorite Grand­mother Mis­sion­ary. Her love and care for our chil­dren and the fos­ter moms and grand­moms ‚who care for them, is contagous. We hope you enjoy hear­ing from Linda. I have been here almost four weeks and it has rained almost every day. The storms beat on the tin roofs so that you can’t hear any­thing and the roads are a mess. This is a land of extremes with a rainy sea­son and a dry sea­son. God has sent the rain and life is com­ing back into the land now. With­out the bless­ing of much rain the peo­ple would die of hunger, so we praise Him for the rain. Every­thing is green and beau­ti­ful with wild flow­ers bloom­ing and our gar­dens are begin­ning to grow. It was won­der­ful to see my chil­dren again and be back to work with them. My sched­ule is slower now because of the rain but it is still busy. Between Eric and I, we are keep­ing up with all the things that need to be done. Bible stud­ies and food dis­tri­b­u­tions con­tin­ues, rain or sun­shine, along with many other things. Brenda will be gone until April and we miss her. The goat herd is increas­ing and is up to 96 goats. Sev­eral new babies have been born this month. With all the green grass they are fat and healthy. Rainy sea­son always brings it share of sick­ness, espe­cially malaria. Our peo­ple know God as their healer because of see­ing Him con­stantly touch­ing lives. Yes they take med­i­cine but they know that only God can heal and they depend on Him for healing. All is well with my soul – I pray the same for all of you . Make a sep­a­rate note stat­ing this gift is for Linda’s support. Eric has been in con­tact with me dur­ing this last week as 10 days of rains has caused some destruc­tion among our wid­ows homes. One widow and her child had to be moved to a spare home on higher ground because so much water passed around her house that the walls cracked and were threat­en­ing to fall in. 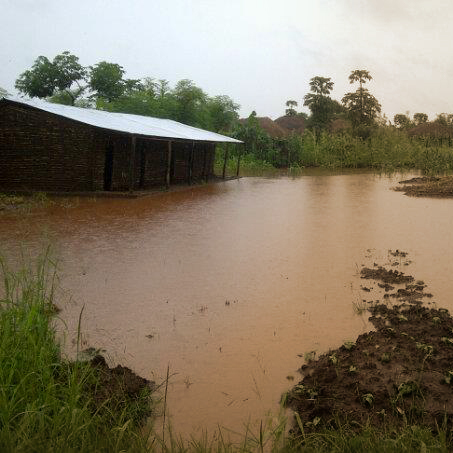 The flood­ing was so intense in that area, that Eric had our work­ers knock down the walls before some­one was hurt by falling mud bricks. The Triplet’s home was also dam­aged by rivers of water flow­ing around it, as the ditch­ing to pre­vent prob­lems was not ade­quate to con­trol such a large amount of water. They also were moved to an alter­nate home so our brick lay­ers could begin repairs today. Only 1 cor­ner of this home was affected and can be repaired since the tin roof stands inde­pen­dent of the mud brick walls. Keep them in your prayers, as too much rain not only dam­ages homes, putting peo­ple in jeop­ardy, but it DESTROYS THE FIELDS OF CORN AND BEANS which all of us depend on for our yearly food. Two sets of twins and 2 sin­gle births were recorded last week with all mama and baby goats doing fine. This brings our total to 96! Our 5 mem­ber board met on Sat­ur­day to hear my report of last year’s accom­plish­ments, and to dis­cuss and approve the 2013 pro­gram. Our biggest chal­lenge is find­ing more help as Leona Phillips decided to return to her fam­ily. We praise the Lord that Linda Stan­ley has returned to be with Eric so he is not alone dur­ing the rainy season. Please keep mis­sion­ary helpers as well as love gifts for our chil­dren in your prayers. The eco­nomic decline has caused a decrease in our monthly dona­tions. Our prayers are for FULL BARNS so we can feed the chil­dren, and finances to sup­port our children’s pro­gram with includes the 14 Pas­tors preach­ing the Gospel in our 19 bush churches. We serve a BIG GOD and with your prayers of agree­ment, we eagerly await God’s pow­er­ful solu­tion to this challenge. NOTE: The new DVD update of our 2012 work is now avail­able for view­ing from our web­site as well as on U-TUBE. Go to orphansunlimited.org, and click on the U TUBE but­ton and watch the video. I’ll be show­ing this DVD where ever I speak, but we wanted all who can’t make it to the meet­ings to share in our joy at what God helped us to accom­plish in 2012. This week is the San Anto­nio, TX area tour. I will speak in 5 cities this week. ( San Anto­nio, Sequin, San Mar­cos, Austin, and New Braun­fels). Check out my speak­ing sched­ule on our web­site: www.orphansunlimited.org or con­tact my office for details if you’d like to come to one of these pro­grams. I look for­ward to vis­it­ing with many of my friends at one of these locations.